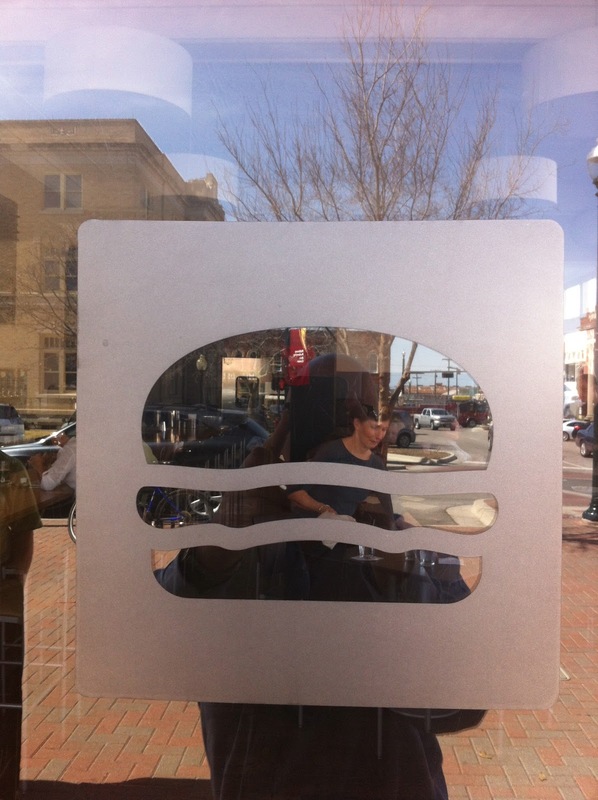 I was sold, so when lunch time rolled around we drove to the square in downtown McKinney. We found a parking place and walked in. The first thing I noticed was the decor – wood floors, high ceiling, long bar on the left wall. While it wasn’t an issue at lunch, I imagine that this place could get LOUD. In a hurry. The bar was lined with at least 30 taps and they had a modest wine list on the chalkboards on the back wall. Floor to ceiling windows lined the streets. A very attentive maitre d’ appeared out of nowhere and took us to a table. This was definitely an “up-scale” as opposed to a “hole-in-the wall” burger joints with burgers in the $7-$12 range a la carte. 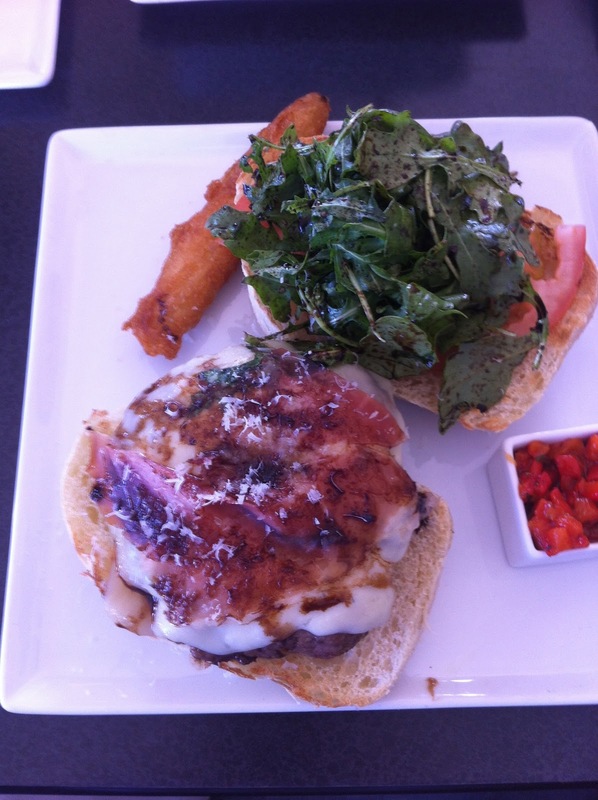 The selection was broad – ten listed burgers (including salmon, tuna and turkey) along with salads, plates and some appealing looking sides (three mini-grilled cheese sandwiches with tomato soup). At least they looked appealing from the menu description. The special menu included a celery root and apple soup, pork chops, a chicken dish and a charcuterie and cheese plate. My companions ordered sides for the table. 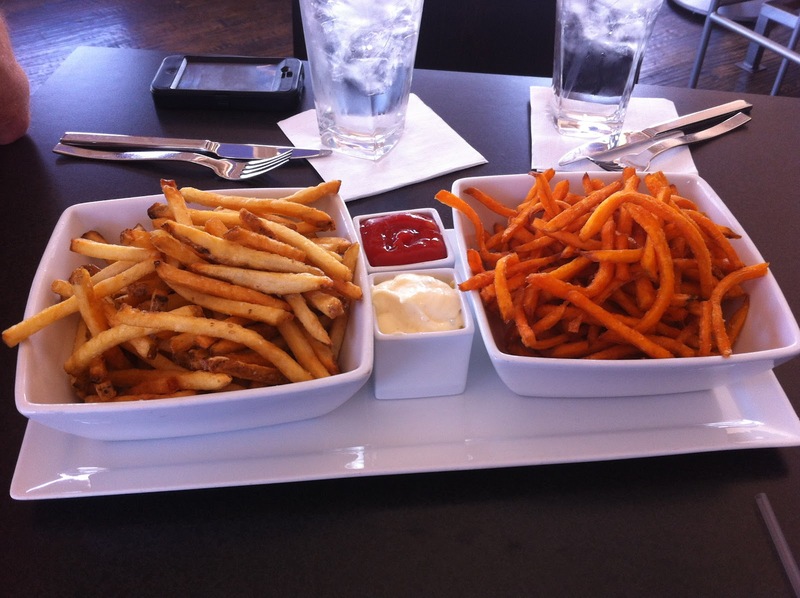 A big bowl of French fries and sweet potato fries, with sides of ketchup and mayonnaise. The fries arrived first and were thin, crispy, hot and slightly sweet. Good start. 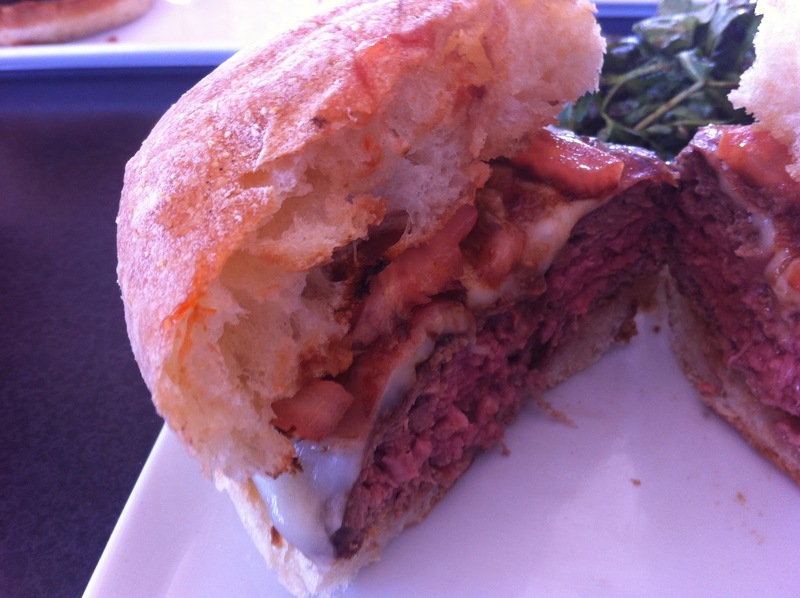 I have a fundamental problem with a great burger served with bad fries. Are you listening Burger King? These fries portended good things to come. My lunch mates ordered a turkey burger on wheat and a Smokey Jack burger (smoked mozzarella, monterey jack, apple-smoked bacon and fried onion strings). I went with the High Society Burger. Seven ounces of locally sourced Genesis beef, topped with thinly sliced prosciutto di San Daniel, aged balsamic, arugula and fontina cheese (I had the roasted red pepper relish on the side), served on a slightly oblong roll. The waitress recommended it “medium” and it was cooked perfectly. I devoured every bite. Then the three of us fought over the last few crispy fries. Definitely a winner.